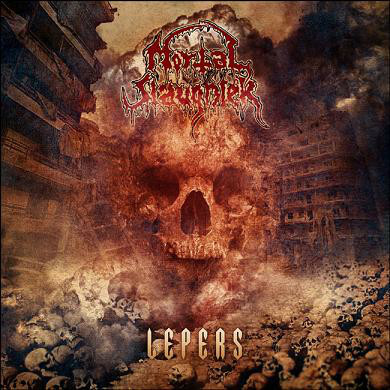 If only one album should be chosen as the very best record of the early '90s Eastern European extreme metal field, I would certainly chose "Lepers" by Mortal Slaughter. Not because the band did anything revolutionary new, or something remarkable that no one tried before. Simply because they merged all features in their music why old school death metal could be liked, and they did it on such a high level like not many others were able to do. Plenty of names could be mentioned as possible influences, but the two most distinguishable ones which gave the main character of the album are the references to Death, and the harsh growling style that is reminding to the genuine and brutal voice of Marc Grewe from Morgoth. "Lepers" is a strongly thrash influenced album and doesn't lacks heavy metal-like themes either. It's like a re-defination of the development of death metal by bringing out the maximum from all of it's components. Excellence in music and what is maybe same important: includes an awesome feeling that's probably not possible to repeat or to imitate. This unworthily underrated album had to wait a lot for a remastered re-release, but it deserves to take place in the line of the gretest records of the genre.